This is for those who want to have their espresso and eat it – it might sound strange, and I must confess it does, but I’ve thinking for a while, “there must be something I can eat, apart form coffee cake, that I can use espresso as a key ingredient”. So here it is, merging my passion for coffee and cooking together for what I call a “tasty” experiment, I wish to introduce Espresso French Toast. Before taking you on this journey of sensual pleasure, what exactly is French Toast, for those of you not into cooking and baking. 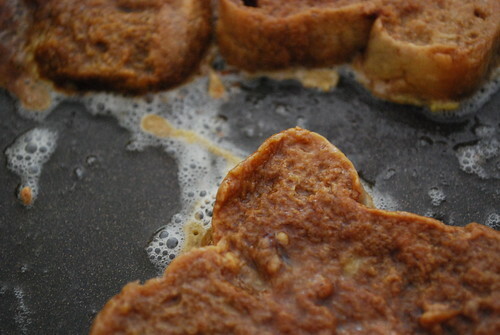 In short, French Toast is actually the posh word for bread dipped in mixed egg and fried until well done. It is usually topped with something sweet like strawberry jam, maple syrup or honey. I’m also guessing it was devised in a French kitchen many years ago. An appetite, but of course. Luckily, I’ve managed to capture the whole experiment visually to make it easy for you to follow. First up, break one large, preferably organic egg into a bowl, mix and set aside. Extract one double espresso into a shallow bowl and put two spoons of caster sugar inside and mix to dissolve. It is crucial that you extract good espresso – as you can see from the pic below, the crema is ever present, and after all this is a blog about coffee and there is no compromising when it comes to coffee. I used my Andronicas Signature Blend arabica coffee, which has nut and chocolate like qualities with a vanilla twist – this is important as you’ll see later. Get your slices of brioche and place very quickly into the espresso mixture as you don’t want the slices drenched in coffee. 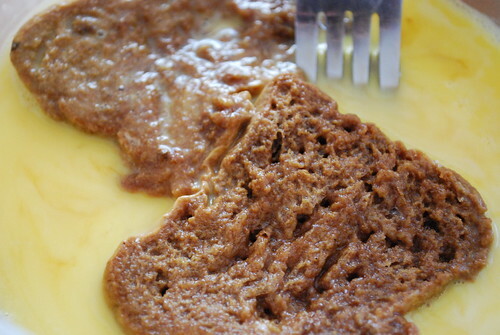 Quickly take it out and place straight away into the egg mixture, making sure it is nicely coated in egg. Place into a hot frying pan with a knob of butter and fry each side for about 2 minutes each. Take out and place on a plate, top with something sweet like honey or jam, or if you are flashy like me and love sweet fattening things, top with a dollop of mascarpone, slices of strawberries and maple syrup. So what does it taste like then ? Well ! 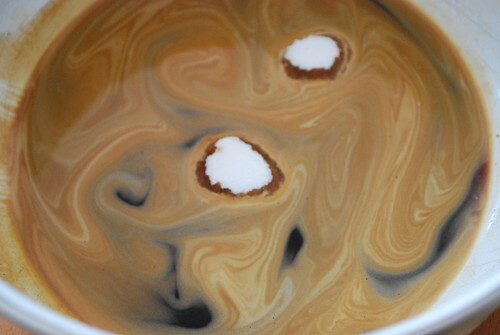 you’ll be pleased to know that the coffee elements have not been drenched out because of egg and butter. It actually had a vanilla and chocolate taste, almost like a dessert. 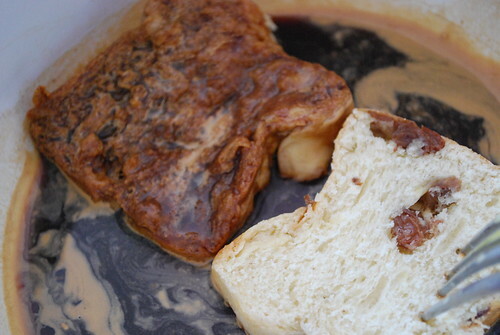 Note that if you are going to drench your bread into coffee, the coffee should be good, displaying as much of the good qualities of a well extracted espresso as possible, so that the lovely taste is captured in the bread. Needless to say, I was pleasantly surprised, if not, let’s face it, I won’t be blogging about it. Don’t tell too many people about this recipe as I would love to serve it in my trendy cafe, if I ever get the opportunity to open one up before I die. 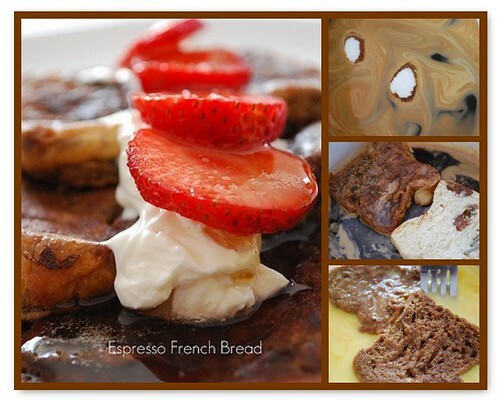 This entry was posted on Wednesday, June 24th, 2009 at 9:14 pm	and tagged with Andronicas, espresso, espresso french toast, french toast, La Marzocco, mascarpone, strawberries, sweet and posted in Coffee Recipes, The Art of Coffee, Thoughts. You can follow any responses to this entry through the RSS 2.0 feed. looks amazing, i’m quite a fan of french toast but had never thought of adding coffee. i may try this at the weekend.